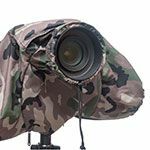 This rain cover is designed specifically for DSLR cameras and will suit Canon EOS cameras with or without an attached battery grip. Fully accessible with two arm sleeves and a zip at the base for tripod mounting. 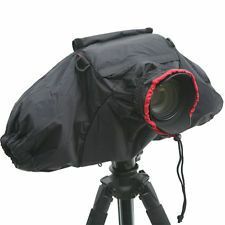 This rain cover is designed specifically for DSLR cameras and will suit cameras with or without an attached battery grip. The cover features two arm sleeves with elastic cuffs (unlike our Heavy-duty raincover (Ref: R016), which only has one arm sleeve). A water resistant zip runs the full width at the base, making inserting a camera into the cover an easy process. Dual zip pulls allow the camera to be tripod mounted. The rear panel has a large clear polythene panel for viewing of the camera's LCD monitor. This panel is deep enough to suit pro-specification cameras with a status screen beneath the main LCD. At the top of the clear panel is a cut-out for the camera viewfinder, while a drop-down protective flap covers the viewfinder when you are not using it. The camera's protective eyepiece can be used to fix the viewfinder in position through the cut-out. Available in black or camouflage.